Are you experiencing symptoms which you can't explain? Have you begun feeling sad, low, or sluggish with no reasonable explanation of why this is happening? From unexplained weight gain or loss, to dry skin, and even anxiety and depression, the answer might lie in your thyroid. Although we tend to think of anxiety and depression as happening in our brain, our hormones and endocrine system present in the whole body can affect your mental health in ways you might not suspect or realize. Today we are going to look at how symptoms of anxiety and depression can be exacerbated by thyroid conditions. So to learn more about this unexpected origin of some mental health issues, keep reading. Recap: What Is Your Thyroid? The thyroid is a butterfly-shaped gland which sits at the front of the neck, beneath your Adam's apple (or where your Adam's apple would be). It is responsible for the secretion of hormones that regulate functions such as breathing, heart rate, body temperature, and body weight. Thyroid hormones are vital to the functioning of the body, and an imbalance can cause major issues. 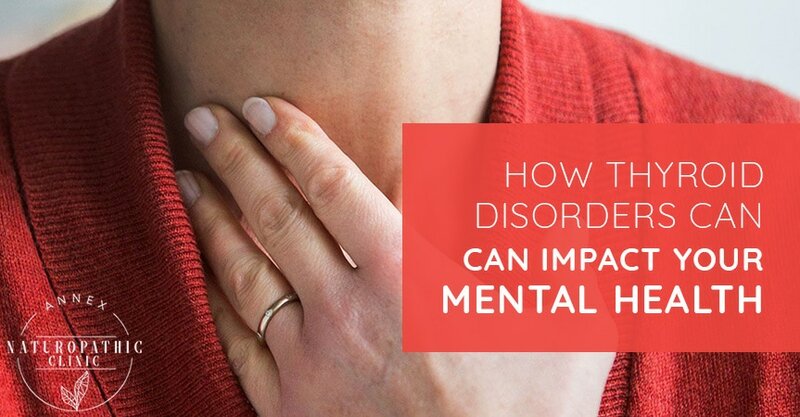 You might think of mental health issues originating in the brain, however hormone levels can have a major impact on how we feel - one of the major hormonal influencers, the thyroid, can definitely affect our mental health. Keep reading to learn more about this unexpected link. Feeling low lately? Your thyroid might be to blame. Symptoms of depression may include lack of focus, loss of motivation, irritability, sadness, and generally feeling “low”. 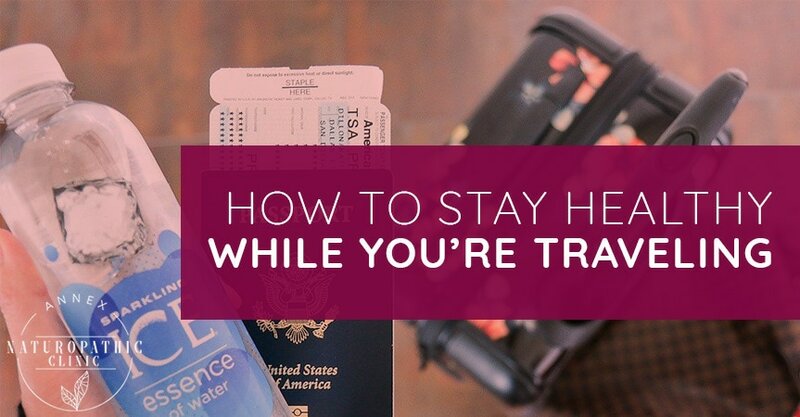 You might have a general feeling of slowness, headaches, stomach pain, and more. If you begin feeling these symptoms, especially if you don't have a history of depression, you might be suffering from hypothyroidism. Although depression and hypothyroidism (when your thyroid gland does not produce enough thyroid hormone) are two separate disorders, depression can be a symptom of hypothyroidism. If you're diagnosed with depression, but you aren't sure it's the right diagnosis, ask to have your thyroid levels checked. If your thyroid is found to be under-functioning, treating the thyroid may be a more appropriate option than using antidepressants. Additionally, some treatments which are used for depression can interfere with thyroid function. An example of this is lithium treatment, which reduces the amount of iodine that the thyroid gland can access; iodine is needed for the production of the thyroid hormone, and thus making the problem worse, not better. You have likely felt what it is like to be under high amounts of stress at some point in your life. At this time you may have had increased irritability, neglected self-care activities such as exercise and eating well, and possibly gained weight. When you're stressed your body releases cortisol, a hormone produced by the adrenal glands. When levels of cortisol are elevated, it can block the production of thyroid hormones, which impacts both your mental and endocrine health. When you put these together it becomes a spiral - your thyroid is not working well, so you feel tired and low. Your body reacts to stress by increasing the release of cortisol, which then further impacts your thyroid production. This is a cycle that can be stopped by working to reduce stress, and thus reducing cortisol and allowing thyroid hormones to be produced. If you suspect your thyroid levels are low and are looking for a natural alternative to synthetic thyroid medications, Annex Naturopathic can help. We will determine if hypothyroidism is your issue, and if indicated we can prescribe natural thyroid replacement therapy, while also offering you a comprehensive treatment plan. Winter has been renowned for centuries for bringing the doldrums, also known as the winter blues, and science has proven it to be a legitimate condition which we call seasonal affective disorder. This disorder has what may be the most appropriate acronym of all time – SAD. 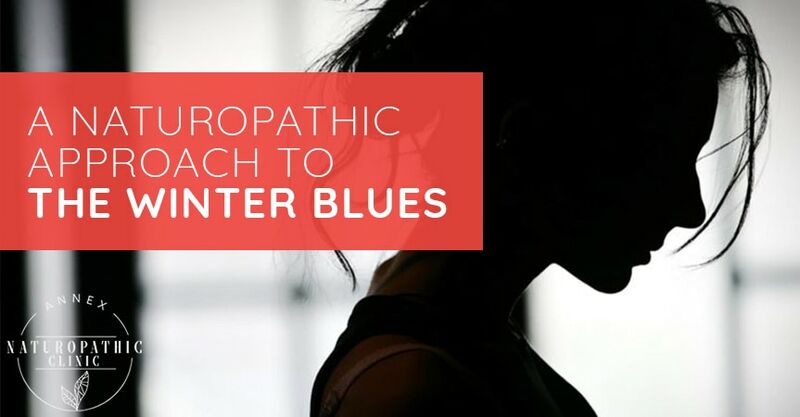 One of the many things a naturopathic doctor can provide is treatment for SAD by addressing potential vitamin deficiencies, which can be very helpful in lessening the effects of seasonal affective disorder. Let's talk more about this health concern today. 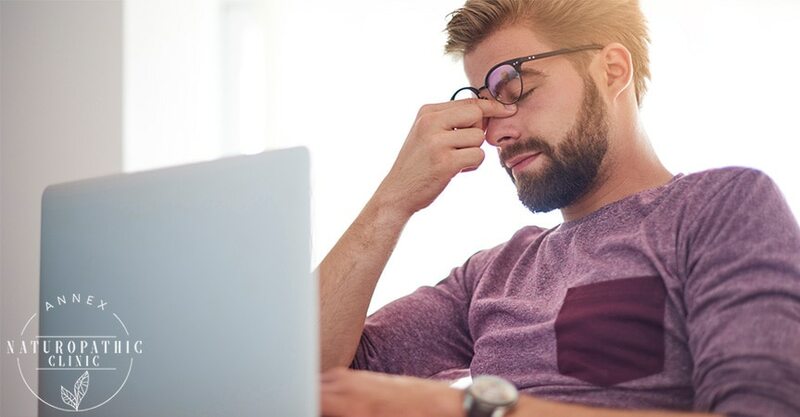 Seasonal affective disorder is generally experienced during the winter months, and is often tied to the shortened days and the change to daylight savings time. People experience SAD in different ways, for different lengths of time, and at different intensities. However, there are specific symptoms that you can detect within yourself and your loved ones in order to know when it's time to ask for help. Seasonal affective disorder occurs when the body is exposed to less sunlight than it needs to maintain optimal hormone, mineral and vitamin levels – particularly serotonin and vitamin D.
Seasonal affective disorder has also been linked to a genetic mutation of the methylation pathways, which can be assessed by a naturopath and treated using methyl donors, supplying you with what you need to steer clear of SAD. Science has shown how SAD is related to the reduced exposure to sunlight, and has also given us a solution to that problem: a way of harnessing that light to deliver it on-demand. Using a 'sunlight lamp' to ease your transition into the dark winter months can be a very helpful and easy way to treat SAD. All you need to do for this is turn it on and sit in front of it for as little as half an hour daily – it doesn't matter if you're reading, watching TV or preparing for tomorrow's presentation – the specific light frequency that helps your mood most is happily being absorbed into your body. It's a good idea, though, to use this light during the hours when you'd normally experience sunlight. Because of the energizing nature of these lights, using them before bed can end up disrupting your sleep. Shutting off your sunlight lamp at least 2 hours before you go to bed (along with any electronics) is ideal. Nutrition is a crucial factor in providing your body and brain what it needs to survive the season. Make sure to favour whole foods, a plethora of fruits and vegetables, as well as food rich in omega fatty acids such as fish, and eggs. Foods to avoid include sugar, caffeine, alcohol and carbohydrates, as they can cause intense mood fluctuations throughout the day. Vitamin D has long been known as the 'sunshine vitamin', and while the sun is low in the sky, you're typically notproducing enough vitamin D to maintain healthy levels. Vitamin D can be taken easily as a supplement. As a bonus, vitamin D helps your body absorb calcium, and can help protect you against colds and infections – another common wintertime health problem. Vitamin D testing is essential for transitioning in to winter. 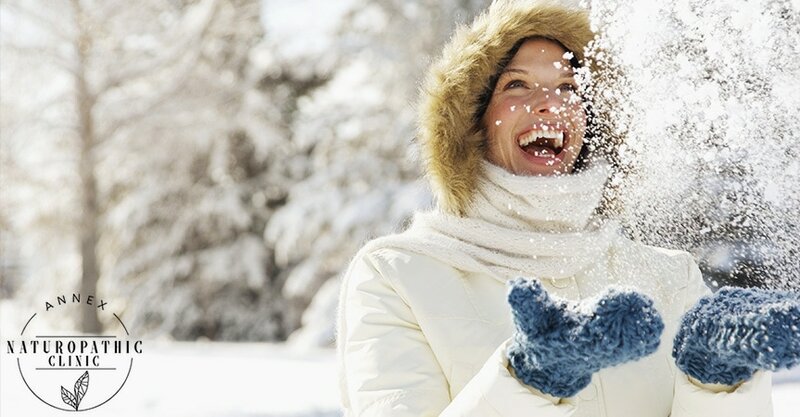 Obtaining accurate serum levels of vitamin D will guide your doctor on the appropriate dosing you will need to ensure that your levels reach and maintain optimal levels throughout the winter. Exercise is powerful, because it simultaneously combats many of the symptoms of SAD. • Fitting in a workout can improve your self-esteem, especially if it involves mastering complicated dance steps, learning tough new yoga poses, or besting an opponent in sparring. • While you might be tired from your workout, people who exercise regularly report better sleeping patterns, and quality of sleep. These people experience less fatigue throughout the day. • Exercising often involves getting outside – such as skating, skiing or a winter run – and this gives you the best chance at absorbing fresh air, sunlight and vitamin D naturally. At Annex Naturopathic, we help you to identify the specific symptoms that you are experiencing in order to help you find the best treatments for you. Luckily, we have an arsenal of natural approaches to SAD, so call now to book your free consultation, and we'll get you started on the road back to more even moods.